Business Secretary Sajid Javid has ordered an investigation into the "abuse" of tipping in restaurants. This follows reports that some restaurant chains are regularly holding back some or all of the tips meant for their staff. The investigation will consider whether there should be a cap on the proportion of tips businesses can withhold. Trade union Unite opposes this, however, saying it would be "impossible to enforce". Mr Javid has ordered a formal call for evidence which will end in November. The investigation will look at how tips left by customers are handled after recent reports found that a proportion of tips at some restaurants were being spent on administrative costs. There is a voluntary code of practice but restaurants can adopt their own systems. Unite officer Dave Turnbull said the union was pleased that "the government has woken up to this scandal" but an effective solution needed "careful consideration". "Capping admin fees will simply legitimise the underhand practice of restaurants taking a slice of staff tips and be near enough impossible to enforce," he said. "Rather than tinkering around the edges, Sajid Javid should be looking to scrap what is effectively a tax by restaurant bosses on money meant for the pockets of hardworking staff." Mr Javid said the government wanted a "fair deal" on pay for working people and that this included "taking action on tipping abuse". "I'm concerned about recent reports, suggesting some restaurants pocket tips for themselves. That's just not right," he said. "I've ordered an immediate investigation to look at the evidence and consider the views of employees, customers and the industry to see how we can deal with the abuse of tipping." Restaurants have the highest corporate mortality rate. They pop up and disappear from our high streets with daffodil-like regularity. That's because consumer tastes can change rapidly but also because profit margins are often very low. Add in high rents and staff costs in Britain's largest cities and restaurants will say they need to maximise every source of income to stay afloat. But consumers tend to side with waiting staff when it comes to tips. They assume staff will see most, if not all of them - especially if customers have been asked to pay an 'optional' service charge of at least 10% on their bill. Adding tips to the existing code of practice among restaurants (which is voluntary anyway) may be the solution. But it may be tough to police. Most waiting staff are either young or foreign - meaning they don't know the law and don't wish to upset their employers. As part of the investigation information and views from the hospitality industry and other key stakeholders will be sought. This will help the government decide if ministers need to intervene to strengthen the voluntary code of practice. Ufi Ibrahim, chief executive of the British Hospitality Association, said the body "would welcome dialogue with the business secretary on the matter of tipping and the industry code of conduct." Most chains use a "tronc" system, where all the tips are collected together and distributed evenly through the staff, usually with around 70% going to the waiters, and the rest given to kitchen and other workers. There is no law regarding how a tronc is divided, however. A spokesperson for Pizza Express said: "To cover the administrative costs of ensuring that the tronc system is managed correctly and fairly, a small administrative fee of 8% is levied. Under no circumstances does Pizza Express generate additional profit through the tronc." 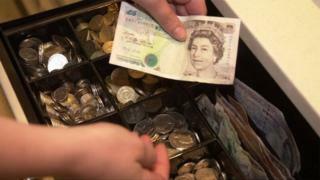 Many high-street chains deduct fees from tips. These include: Ask (8%), Belgo (10%), Bella Italia (10%), Café Rouge (10%), Prezzo (10%), Strada (10%) and Zizzi (8%). Recently Giraffe has scrapped its 10% admin fee on tips, joining chains like Restaurant Group, Carluccio's, Garfunkel's and Jamie Oliver's who do not deduct a fee. Research from 2009 found that one in five restaurants did not pass tips to their staff, yet the vast majority of customers said they wanted waiting staff to receive the money left for them, the government said. What happens to waiters' tips?